Paper Wins Slots & Bingo Sites! Read all about it; Paper Wins Slot is the hot of the press game from Gamesys! 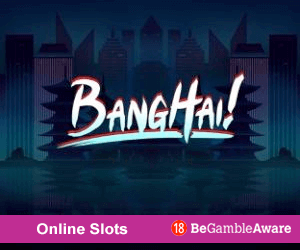 Featuring 15-paylines, multipliers, free spins bonuses and a 10,000 x top prize! 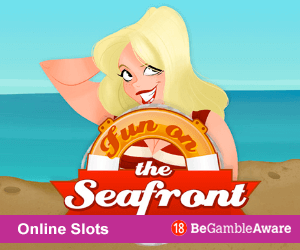 This is one major winning heading slot game which won't end up on your weekly fish and chip wrapping paper! Pair the game with the 'Daily Paper' Daily Free Game available to play on selected Paper Wins slots sites for the chance to win even more prizes including Free Spins! A popular Gamesys slot game, Paper Wins Slots has been themed on a Daily Newspaper which originated from The Sun's Winning Headlines slots after Sun Bingo and Fabulous Bingo moved to Virtue Fusion software taking its game with them. 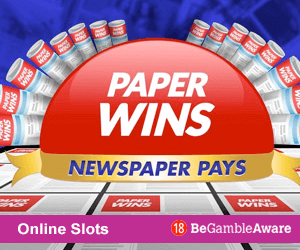 The Paper Wins Slot game features 15 Paylines over 5 reels which as symbols designed around the news theme with Sports, Free Hols, Bars and Fruit and Scatters and Wilds. 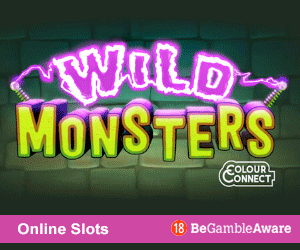 There is also a bonus feature game which awards free spins and multipliers. 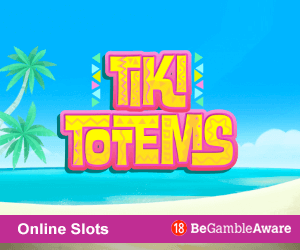 Playing on Desktop, Mobile or Tablet is easy, simply choose one of the sites with Paper Wins slots and load up the game. Select your coin size from 0.01 - 10p per line, lines are adjustable and you can play between 1 - 15 lines which you select using the Bet One button. There are no additional features such as Autoplay, so all you need to do is hit the Spin button. The Free Spins Bonus is an extremely simple one which can appear within the game quite a frequently. Landing three newspaper symbols on a winning pay line will then initiate the Pick Bonus feature. Select a Newspaper symbol in view on the reels to reveal the number of Spins and multipliers won. The Free Spins will then begin. With every Free Spin, you are guaranteed to win a multiplier x coin size. If you are lucky enough to land three or more newspapers during your active bonus, then you will have lucky repeat of the spins bonus where the number of spins you had initially won are readded. If you are looking for bingo sites with Paper Wins Slots, you might have even more fun if you play with sites like Virgin Games, Jackpotjoy Bingo, and Heart Bingo as they also have the Daily Free Game, 'Daily Paper' where you could win free spins on Paper Wins slots! Daily Paper is a Daily free game for funded members who have spent £10 since joining which you can play every day from Monday to Sunday. The game takes place on a newspaper-themed designed grid, and the aim is to pick squares from the grid to uncover symbols in the hopes of matching up for prizes! Available for members only, there is also a demo which you can play with any of the Gamesys sites with the Paper Wins Slot game. This sensational five-reel slot game is hot off the presses and ready to print! As you can expect from a slot game from Gamesys, Paper Wins is super easy online and mobile slot game to play with plentiful wilds and scatters and exciting free spins multiplier bonus with you can retrigger and the best part it won't break the bank as you can play for a penny and choose the number of lines you want to play. 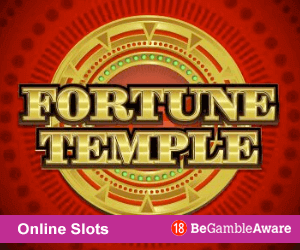 One criticism would be the lack of an Autospin button to prevent the sore wrists from clicking, but overall it is a fun game which you can play for free with the demo or for low stakes on various gamesys sites which have Paper Wins Slots. Plus when you include Daily Paper in your gameplay on a variety of Paper Wins slots sites, you will get even more chances of hitting the headlines if you win those free spins and cash prizes!